When I was 25, I was a missionary in Coventry, England for The Church of Jesus Christ of Latter Day Saints. 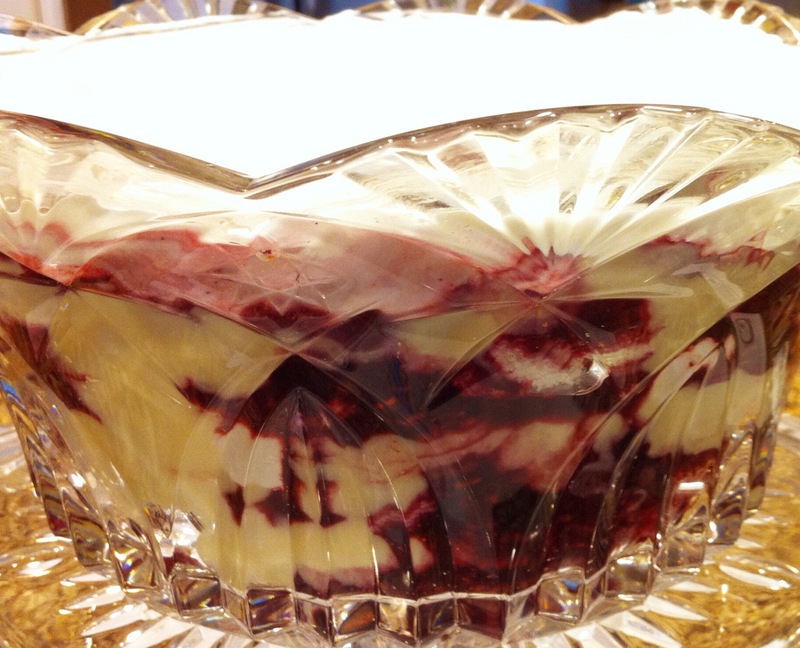 During my 18 months there, I was introduced to the most amazing dessert ever…Trifle. Wikipedia defines Trifle as “an English dessert made from thick custard, fruit, sponge cake, fruit juice or jelly and whipped cream. These ingredients are usually arranged in layers.” On my mission, we usually purchased a trifle kit at the grocery store which included canned fruit cocktail and jelly (Jell-O). Whether homemade or from a box, pudding is essential. And I must say, there is no substitute for fresh whipped cream. The kind in the can melts too quickly and Cool Whip is not real food. Seriously folks, I hate to break it to you, but see for yourself. Contents of Cool Whip Original: water, hydrogenated vegetable oil (including coconut and palm oils), high fructose corn syrup, corn syrup, skim milk, light cream, and less than 2% sodium caseinate (a milk derivative), natural and artificial flavor, xanthan and guar gums, polysorbate 60, sorbitan monostearate, and beta carotene (as a coloring). Obviously, it’s best if you make it homemade. But let’s face it, that’s not going to happen. I usually just buy an angel food cake from the grocery store and try hard not to look at the ingredients. But any kind of cake will do. Shake things up and try different flavor combinations: lemon cake with blueberries, chocolate cake with raspberries or chocolate sauce…you get the idea! Or really go crazy and make a homemade angel food cake without using a mix. I’m going to try this one day and I’ll share the results here on my blog. Place berries in a pot on the stove. Add sugar and cook on medium heat. Mix corn starch in water until all the lumps are gone. Pour this mixture over the fruit. Continue cooking and stirring until the fruit and sauce has thickened. Cool and then refrigerate. It will become more firm in the refrigerator. In a medium saucepan combine sugar and cornstarch. Stir in milk. Cook and stir mixture over medium heat until thickened and bubbly. Cook and stir for 2 minutes more. Remove pan from heat. Gradually stir 1 cup of milk mixture into egg yolks. Add egg mixture to milk mixture in pan. Bring milk mixture to a gentle boil; reduce heat. Cook and stir for 2 minutes more. Remove pan from heat. Stir in butter and vanilla. Pour pudding into a bowl. Cover surface of pudding with plastic wrap. Chill until set and ready to use. Place all ingredients in a bowl and whip until thick and delicious. To assemble: Break one-third of the angel food cake into small pieces and line along the bottom of a glass bowl or trifle dish. Spoon one-third of the fruit and pudding in dollops over the cake. Do two more layers the same way. Spoon all of the whipped cream on top. Garnish with fresh raspberries, strawberries, lemon, chocolate or blueberries depending on what you use as your flavor combination. Refrigerate at least an hour or until ready to serve. Then spoon into dishes and enjoy.